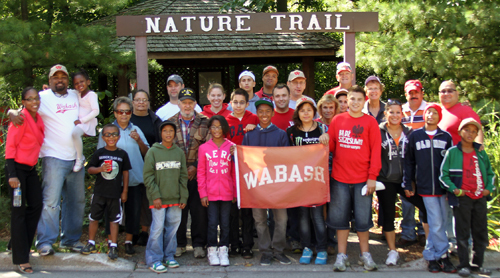 Families, friends and Wabash men made it another stellar Wabash Day in Grand Rapids, Michigan. Over 30 volunteers came together again to assist the Grand Rapids Veterans Home on this special project. We were excited to work with the Veterans Home and to show the veterans a small token of our appreciation for all of the sacrifices they have made for all us and our country. The Veterans Home is a State run agency facing a serious financial crisis and much of its funding has been eliminated. The Wabash team did not let the lack of resources damper the Wabash Spirit - the team pulled together to buy the supplies for the project. The project focused on beautifying the Home's nature trail near the property. The nature trail is a refuge for many of the veterans, as it allows them to leave their room to enjoy a simple pleasure in life, the outdoors. 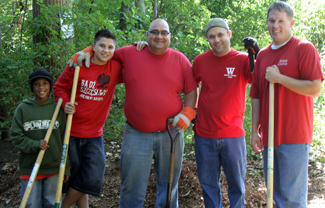 The Veterans Home is really appreciative of our work on the trail and we look forward to other projects in the future. The work we performed included: spreading mulch, planting tulip bulbs, cutting trees, planting flowers, and general cleaning. It was a great day and we are very proud of the community spirit shown during this project!